Take all your decorations off, (usually) leave it by the bins and try to cut the tree down a bit, if you can. Barking and Dagenham has been in touch to say that trees left next to bins will be taken away on normal collection days. Barnet collects from 5 January. If you have a brown bin in Bexley, put it next to the bin and it'll be picked up by the usual crews. If the tree is bigger than your bin, please cut it down (but don't put it inside!). In Brent, cut your tree up and put it in the organic bin. Ealing will collect until 30 January, so long as it's not enormous (cut it down if so). Enfield is collecting as part of its normal garden waste service. Leave your tree at the front of your property on bin day in Greenwich, whether you have a green-top bin or not. Hackney will also collect as part of normal bin services. Hammersmith and Fulham is collecting from homes on 5-15 January. Haringey will collect so long as the tree has been cut down into pieces no longer than 1m. If you chop your tree up, Harrow will take it with the usual brown bin collection — inside the bin, not next to it. If you have a garden waste collection in Havering, cut up the tree and put it in the bin for your normal collection day. Hillingdon will take your tree — so long as it's in pieces of less than 3ft long — with the normal garden waste. Hounslow will collect as part of normal bin day; if you live in a flat give them a call and they'll sort something out. Dedicated crews will be going round Islington on 5-16 January, with normal recycling teams picking up after that. Have a look at Kensington and Chelsea's website to find out your date for Christmas tree pickups. Kingston is collecting trees as part of normal services, 6-16 January. Lambeth will collect the week beginning 5 January. Merton is collecting 5-25 January. Leave the tree where it can be easily seen. You'll have to book a collection to have your tree taken away in Newham. Redbridge takes (chopped up) trees away with its normal garden waste service. Richmond will collect on 5-16 January. Southwark will collect as part of its normal food and garden waste service, or you can book an ad-hoc collection. Sutton is collecting trees on the usual bin days between 6 January and 2 February. Tower Hamlets is collecting, 5-23 January. 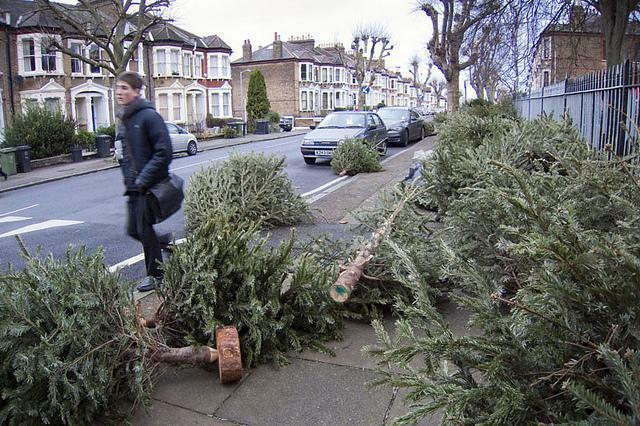 Waltham Forest is collecting Christmas trees left in or beside brown bins. Alternatively, take it to your local recycling centre. Wandsworth will collect trees on 5-16 January on your normal bin day. Barking and Dagenham's recycling centre in Dagenham is taking trees. Barnet's recycling centre in North Finchley will accept your tree. If you live in Bexley and don't have a brown bin, there are two recycling centres you can take your tree to. The Abbey Road recycling centre is another option for Brent residents. There are five dedicated recycling points open 10-11 January in Bromley. Camden has nearly 20 drop-off points which are open until 15 January. The last date to leave your tree at one of Croydon's 17 collection points is 10 January. Many parks in Ealing host drop-off points for old Christmas trees. You've got until 11 January to take your tree to drop-off points in one of several Enfield parks. Millfields depot in Hackney will accept trees until 31 January. There are six drop-off points in Hammersmith and Fulham. There's no deadline given so take it down there asap to be on the safe side. Eight drop-off points are open in Haringey until 22 January, plus the two usual recycling centres. Harrow's recycling centre in Wealdstone will take trees. There are two sites in Havering that will take trees: Gerpins Lane recycling centre in Upminster and Gidea Park Sports Ground (the latter on 4 January only). Four drop-off points are open in Islington until 18 January. There are lots of drop-off points in Kensington and Chelsea, open until 18 January. Lambeth has five drop-off points open between 6-31 January. Choose from one of 12 drop-off points in Lewisham, open until 25 January. The Garth Road recycling centre in Merton is another option for your tree. Richmond's usual recycling centre in Kew will accept trees, and until 9 January there are two other drop-off points available. Southwark has four drop-off points, open 5-31 January. Tower Hamlets's Blackwall recycling centre will accept Christmas trees. Westminster's 23 recycling points are open until 15 January.